How does the air bags system operate? Safety features of your vehicle / Air bag - advanced supplemental restraint system / How does the air bags system operate? The SRS (Supplement Restraint System) air bag warning light on the instrument panel displays the air bag symbol depicted in the illustration.The system checks the air bag electrical system for malfunctions. The light indicates that there is a potential problem with your air bag system, which could include your side and curtain air bags used for rollover protection. The light does not turn on for approximately six seconds when the ignition switch is placed in the ON position. The light stays on after illuminating for approximately six seconds. The light blinks when the engine is running. Have an authorized HYUNDAI dealer inspect the SRS as soon as possible if any of these conditions occur. During a moderate to severe frontal collision, sensors will detect the vehicle’s rapid deceleration. If the rate of deceleration is high enough, the control unit will inflate the front air bags. 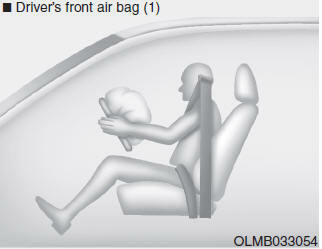 The front air bags help protect the driver and front passenger by responding to frontal impacts in which seat belts alone cannot provide adequate restraint. When needed, the side air bags help provide protection in the event of a side impact or rollover by supporting the side upper body area. Air bags are activated (able to inflate if necessary) only when the ignition switch is in the ON position. Air bags inflate in the event of a severe frontal or side collision to help protect the occupants from serious physical injury. Air bag deployment depends on a number of factors including vehicle speed, angles of impact and the density and stiffness of the vehicles or objects which your vehicle impacts during a collision. The determining factors are not limited to those mentioned above. In addition to inflating in serious side collisions, vehicles equipped with a rollover sensor, side and curtain air bags will inflate if the sensing system detects a rollover. When a rollover is detected, side and curtain air bags will remain inflated longer to help provide protection from ejection, especially when used in conjunction with the seat belts. To help provide protection, the air bags must inflate rapidly. 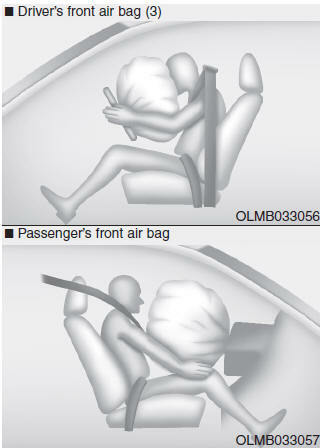 The speed of air bag inflation is a consequence of extremely short time in which to inflate the air bag between the occupant and the vehicle structures before the occupant impacts those structures. This speed of inflation reduces the risk of serious or life-threatening injuries and is thus a necessary part of air bag design. However, the rapid air bag inflation can also cause injuries which can include facial abrasions, bruises and broken bones because the inflation speed also causes the air bags to expand with a great deal of force. You can take steps to reduce the risk of being injured by an inflating air bag. The greatest risk is sitting too close to the air bag. An air bag needs about 10 inches (25 cm) of space to inflate. NHTSA recommends that drivers allow at least 10 inches (25 cm) between the center of the steering wheel and the chest. NEVER place a child restraint in the front passenger seat. Always properly restrain children under age 13 in the rear seats of the vehicle. Adjust the front passenger’s and driver’s seats as far to the rear as possible while allowing you to maintain full control of the vehicle. Hold the steering wheel with hands at the 9 o’clock and 3 o’clock positions. 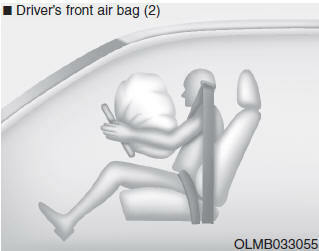 Never place anything or anyone between the air bag and the seat occupant. Do not allow the front passenger to place their feet or legs on the dashboard. When the SRSCM detects a sufficiently severe impact to the front of the vehicle, it will automatically deploy the front air bags. Upon deployment, tear seams molded directly into the pad covers will separate under pressure from the expansion of the air bags. Further opening of the covers allows full inflation of the air bags. Do not install or place any objects (drink holder, CD holder, stickers, etc.) on the front passenger's panel above the glove box where the passenger's air bag is located. Do not install a container of liquid air freshener near the instrument cluster or on the instrument panel surface. After a frontal or side air bag inflates, it will deflate very quickly. Air bag inflation will not prevent the driver from seeing out of the windshield or being able to steer. Curtain air bags may remain partially inflated for some time after they deploy. Open your windows and doors as soon as possible after impact to reduce prolonged exposure to the smoke and powder released by the inflating air bag. 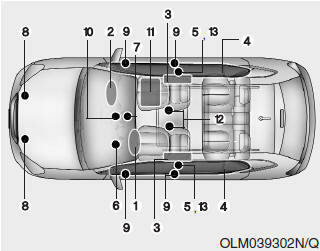 Do not touch the air bag storage area’s internal components immediately after an air bag has inflated. The parts that come into contact with an inflating air bag may be very hot. Always wash exposed skin areas thoroughly with lukewarm water and mild soap. • Always have an authorized HYUNDAI dealer replace the air bag immediately after deployment. Air bags are designed to be used only once. When the air bags inflate, they make a loud noise and they leave smoke and powder in the air inside of the vehicle. This is normal and is a result of the ignition of the air bag inflator. After the air bag inflates, you may feel substantial discomfort in breathing because of the contact of your chest with both the seat belt and the air bag, as well as from breathing the smoke and powder. The powder may aggravate asthma for some people. If you experience breathing problems after an air bag deployment, seek medical attention immediately. Though the smoke and powder are nontoxic, they may cause irritation to the skin, eyes, nose, throat, etc. If this is the case, wash and rinse with cold water immediately and seek medical attention if the symptoms persist.